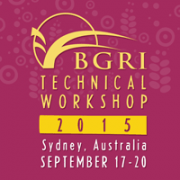 The Borlaug Global Rust Initiative 2015 Technical Workshop will be held September 17-20, 2015, in Sydney, Australia, at the Four Seasons Hotel. Wheat is the most important broad acre crop in Australia. Both stem rust and leaf rust were among the first challenges faced by Europeans when they began growing wheat in Australia. And in 1890 Australia held the first in a series of of “rust in wheat” conferences. With such a long and successful history in wheat rust research and control, Australia is an appropriate country to hold the BGRI 2015 Technical Workshop. This Workshop aims to bring together the most talented and prominent rust scientists to discuss global and regional strategies for monitoring the stem rust race Ug99 as well as for the identification, characterization, selection and incorporation of genetic resistance into wheat genotypes. The event also aims to promote interaction between researchers, students, technicians and policymakers in assessing challenges and opportunities for rust surveillance, and breeding for resistance in wheat in South America. The BGRI celebrated the 100th birthday of the initiative's namesake, Norman E Borlaug, at its 2014 technical workshop. The workshop brought to together scientists, thought leaders, policymakers, and representatives of leading agricultural research-for-development organizations, both public and private to Ciudad Obregón Mexico, March 22-25. The Borlaug Summit on Wheat for Food Security continued the celebration of Borlaug's legacy, from March 25 to 28. In 2012, India produced 93 million tons of wheat for its 1.2 billion people. The success of India’s wheat production today is due to the efforts of Indian farmers, scientists, and Dr. Norman Borlaug, whose vision and tenacity helped reverse the bleak food security situation in Pakistan and India in the 1960s. In the 50 years since Borlaug first set foot on the subcontinent, India has progressed from being a food deficit country to a food sufficient country. 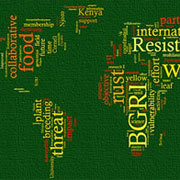 The BGRI 2013 Technical Workshop was held in India to commemorate Dr. Borlaug’s achievements there. BGRI 2013 co-hosted by: Indian Council for Agricultural Research (ICAR) and the BGRI South Asia Center. The 2012 BGRI Technical Workshop was held in Beijing, China, at the historic Friendship Hotel. Hosted by the Institute of Plant Protection of the Chinese Academy of Agricultural Science, IPP is making fundamental, strategic and profound contributions to plant protection, agricultural production and food safety throughout China. The 2011 BGRI Technical Workshop was held in St. Paul, Minnesota, home of the USDA Cereal Disease Laboratory (CDL), and the University of Minnesota, Borlaug’s alma mater and the place of Stakman’s classic work on stem rust. Held in conjunction with the 8th International Wheat Conference, the 2010 BGRI Technical Workshop was held in St. Petersburg, Russia. The workshop was hosted by the world-famous N.I. Vavilov Research Institute of Plant Industry (VIR). The inaugural BGRI Technical Workshop was held in Obregon Mexico to celebrate the life and work of Dr. Norman E. Borlaug. Hosted by CIMMYT, the workshop was also sponsored by FAO, ICARDA, and ICAR.